You are here: Home / How-to / Fight Greasy Hair! 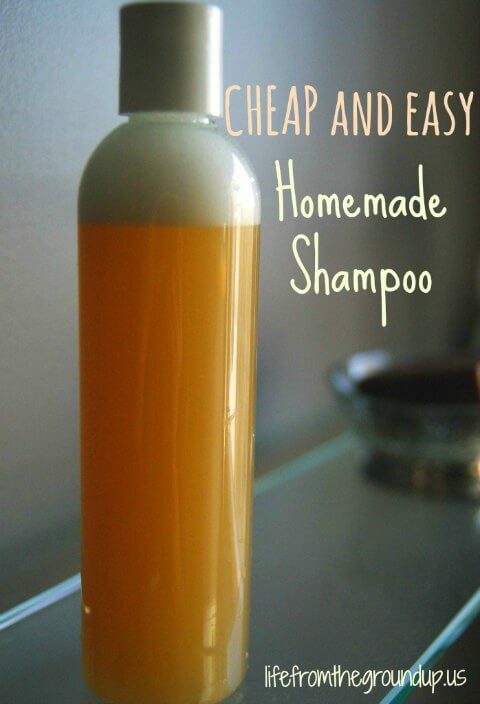 Make Your Own Homemade Shampoo! Fight Greasy Hair! Make Your Own Homemade Shampoo! Greasy hair. I don’t know if it’s just a guy thing, or if everyone’s afflicted once you hit puberty. Whatever the case, my hair was greasy. I tried all kinds of shampoos, but nothing stuck, from the gentlest to the most powerful. They’d all be great for 12 hours, but I had to wash my hair daily to maintain any semblance of un-greasy (I know, wash my hair daily?? Perish the thought.). Thing is, almost every standard drugstore shampoo out there has similar active ingredients. Most of the time, it’s either sodium lauryl sulfate or sodium laureth sulfate, strong surfactants commonly used in dishwashing detergent, car wash soap, and engine degreasers. That’s all great if you’re trying to get the caked-on grease off of your pots and pans (although we try to avoid sulfates in general), but do I really want that on my head? So awhile back, I got to thinking – your body has this funny way of reacting to the environment and adjusting to the conditions. Maybe my hair was extra-greasy because I was washing it with engine degreaser, which took too much of the natural oil away, which made my scalp overcompensate by producing extra natural oil, which… yeah, one vicious cycle. As usual, I started nosing around and found a few non-traditional hair cleaning methods. I tried straight baking soda and wasn’t ready to go directly to the “no-poo” method (okay, it’s more my wife I was concerned about), so I settled on a homemade shampoo that utilizes nothing but water and liquid castile soap. 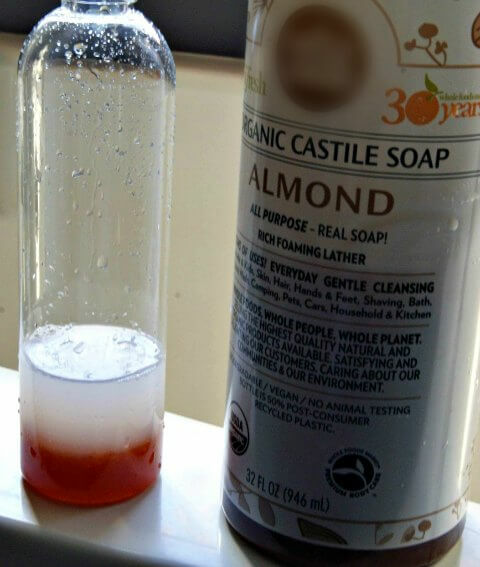 Castile soap is made using vegetable oils like olive and coconut, and is generally a high-quality, gentle cleaner (you can use it in everything from laundry detergent to dish soap to body wash). The easy method to make your own homemade shampoo is this: add 1/4 cup castile soap to an empty shampoo (or other) bottle. Add 3/4 cup water. 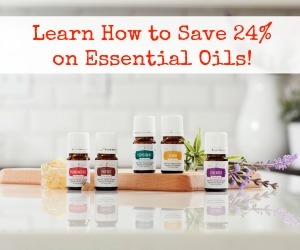 Add a few drops of your favorite essential oil if you want to smell girly (to learn more about the amazing benefits of essential oils, see my Essential Oils page!). Put the cap on and swirl it all around to mix everything together. The easier method is this: use a clear bottle. Add some castile soap. Add water to roughly equal 3-4x the original volume (just eyeball it; it’s not going to blow up or melt your scalp if you don’t follow an exact ratio), then shake the whole thing up. Done. I will warn you – when you start this, your hair will feel greasier than ever. That’s because your scalp is still used to being washed with engine degreaser, so it takes a little time (about a week or longer) for it to settle down and stop producing so much oil. After an adjustment period though, it’s all good. My hair feels natural, is less greasy, and I’m only using the shampoo two or three times a week – the rest of the time I just wash with water, which my wife says is just rinsing, but I disagree. Special bonus tip! Use a 10:1 water-vinegar mixture as a conditioner. It will help remove any residue from your hair and will leave your hair feeling silky – S tried this and her hair was tangle-free (even her regular conditioner left tangles). Interested in more homemade goodness? Clean up your entire routine with this body butter (and a not-so-greasy version), toothpaste, deodorant, lip balm, and shaving soap. Hmmm. As a long-haired AND super-curly-haired woman, I have had great skepticism about natural hair care stuff. I don’t wash my hair every day anyway (curly hair is naturally not greasy) so shampoo isn’t a concern, but the conditioner is crucial. So in the interests of experimentation, I’ll test out this vinegar solution on my hair and see how it works. I hope it does . . . I have long (past my chest) temperamental curly hair. 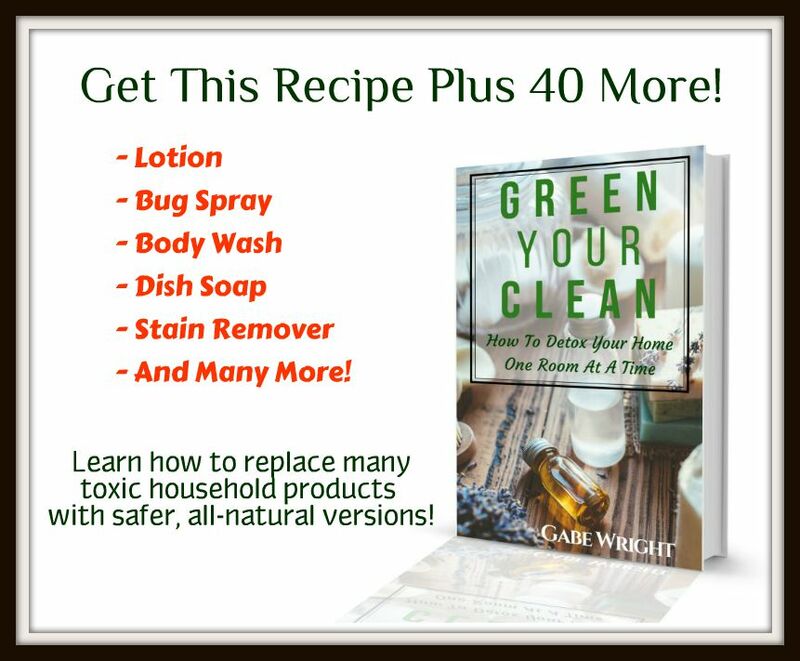 I have tried vinegar and baking soda, castile, coconut milk and aloe, and several other natural methods. Vinegar and baking soda strips and dries your hair out over time. Castile soap eventually leaves a build-up of residue, and the other methods haven’t quite worked for my hair (dandruff, build-up, greasy, no volume, drying, etc.). The best alternative I have used is honey. Warming up a tablespoon or two of honey in some water makes a great hybrid shampoo and conditioner. It’s a humectant, antibacterial, at a good ph level, and does wonders for my hair. I use jojoba oil as my only styling product, and my hair looks far better than it did when I spent an embarrassing amount of money on fancy shampoo, conditioner, and styling products. I highly recommend it. Hi Kelsey, Can you please tell me how much water you use with the honey? 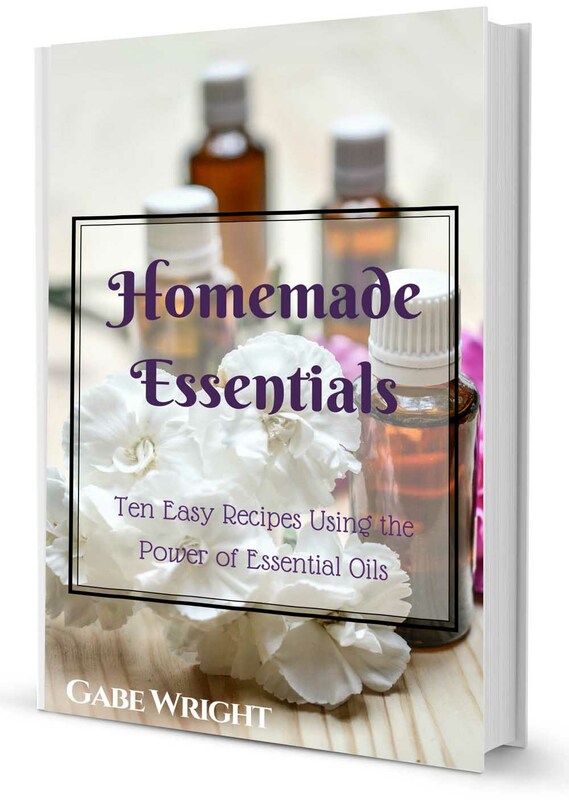 There are essential oils that smell manly like cedarwood, sandalwood and others. We have been using Dr Bronners castille soap as shampoo for years. I just keep a bar in the shower and rub it in my hair to get the shampoo effect. Same idea, just super easy and neat, especially for children. 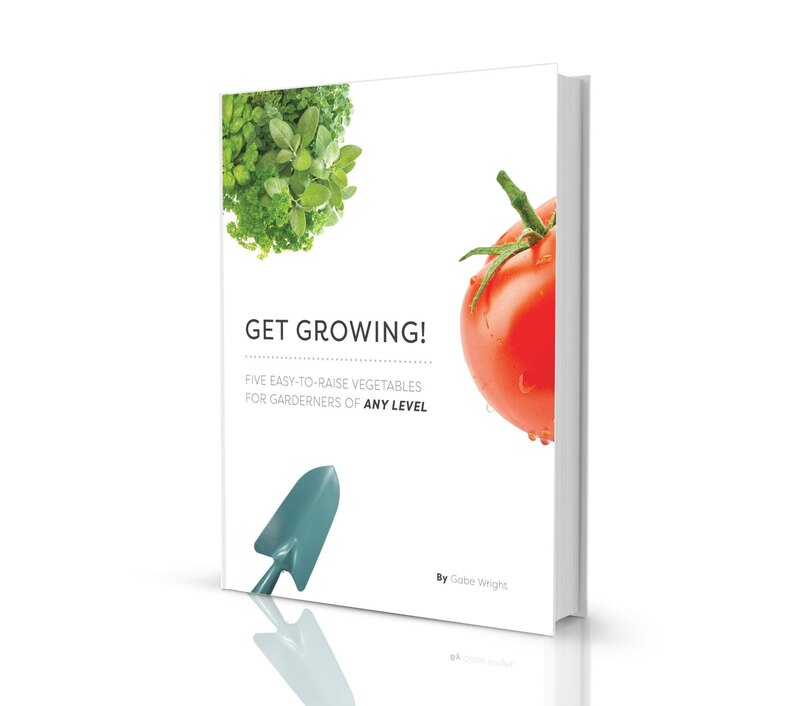 If you’re transitioning to a non-commercial product (i.e. you’ve been using regular store-bought shampoo), your scalp may take a while to adjust, sometimes as long as a month. Your skin is used to creating lots of oil to compensate for the detergents in regular shampoos and it takes time for the skin to realize that it doesn’t need to produce so much oil now. If you’re only on the third try, I’d say that it’s perfectly normal for your hair to be extra greasy – just need a little patience! Also, if you have hard water, you may want to use a diluted vinegar rinse at the end. And finally, not everyone’s hair is the same, and yours might just not like this formula. If that’s the case, nothing to do but keep on trying until you find something that works for you!